Imagine the exciting career opportunities waiting for highly skilled pros who can design, build and maintain sophisticated electronics systems. Now that pro can be you! This distance learning electronics course will help prepare you for an exciting career in electronics technology. Best of all, you’ll earn a professional Certificate of Completion in Basic Electronics from CIE Bookstore suitable for framing when finished. - 39 learn-at-home lesson modules on text. - 2 hands-on training labs with 53 exercises. - Instructor support from CIE's faculty. 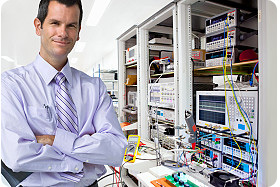 - Certificate of Completion in Basic Electronics when finished. - Access to CIE's e-grade site where you take your online exams. - Free access to CIE's school paper The Electron. Quickly learn the basics and then move on to semiconductors, printed circuit boards, identifying components, Ohm's law, relays, robots, reliable soldering techniques and much, much more! 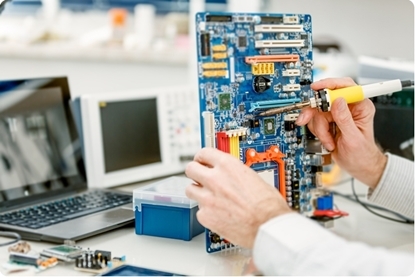 With the 2 hands-on training labs you’ll acquire the confidence and knowledge needed to repair, maintain and program electronics equipment used in business and industry. You’ll have proven hands-on experience with printed circuit boards, soldering irons, soldering techniques, test components, project boards and more! Instructor support is included with our Basic Electronics Course so you never have to study alone. Study electronics at your own pace and if you ever have a question call us and we’re there for you. As a CIE Bookstore student you’ll have access to CIE’s e-grade web site where you can take your exams online. These are the same 39 lessons found in CIE's Electronics Technology with Lab Diploma program. Cleveland Institute of Electronics is an electronics school that offers Diplomas in electronics technology and troubleshooting. You could transfer any completed lessons from this course over to CIE's Electronics Diploma and get full tuition and academic credit. 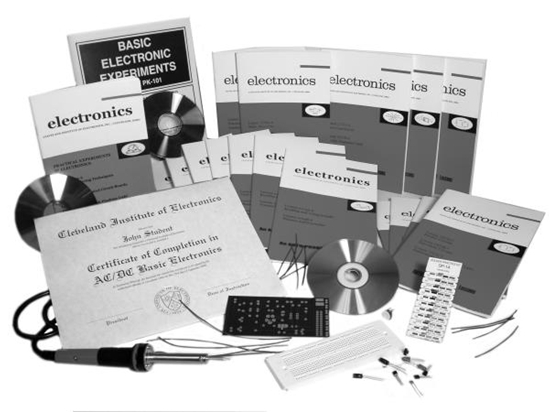 The electronics fundamentals lab includes a manual and all the parts necessary to complete fifty different instructional exercises. A solderless circuit board is provided and makes experimentation easy, even for those who have never touched a soldering iron. Students learn electronics theory and the nature of electronic components. The printed circuit board lab is useful for electronics technicians for they are found in almost every electronic device today. 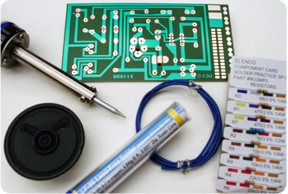 The printed circuit board and solder practice lab will show you good soldering techniques and help you become familiar with a variety of electronic components. Learn the characteristics of static electricity and how it’s put into motion to form current electricity. Learn how negative numbers are used in electronics and how to sum up voltages around a series or loop. Voltmeters and their use, Kirchhoff’s Voltage Law, Figuring Voltages in Series Circuits. 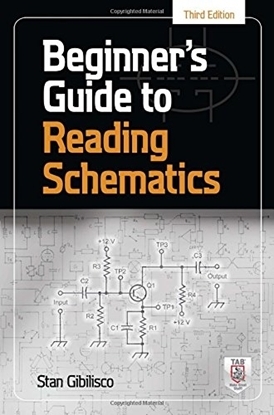 Logic Circuits, AND Circuits with Switches, OR Circuit with Switches, Combination AND/OR Circuits, Boolean Algebra Computer Shorthand, The Relay - An Automatic Switch, Relay Operation, Using Relays to Switch Heavy Currents, Controlled Circuits and Controlling Circuits, Relay Poles and Throws, Normal Position of Relay Contacts, Circuits with more than One Relay. Using one battery to do more than one job, AND Circuit with Relays, A Robot for Rover, OR Circuit with Relays, NOT Logic Circuits, AND Circuit with NOT, A Circuit for Taming the TV, OR Circuit with NOT, Other Logic Circuits. A knowledge of scientific notation is essential for the best jobs in electronics. In addition, this Basic Electronics Course comes with Superior Student Privileges so you never have to study alone! Use our toll-free Instructor Hot-line to access our faculty and staff if you ever need assistance with your course work. CIE's dedicated staff of instructors do more than just grade your exams; they help guide you, step-by-step, through your studies and hands-on electronics experiments. After finishing the Basic Electronics course you'll receive a certificate of completion in Basic Electronics suitable for framing! How do I enroll in the Basic Electronics Course? 2. 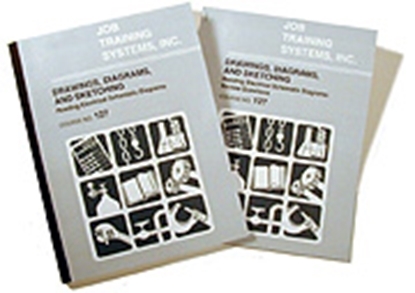 Call us at (800) 321-2155 and ask for the Basic Electronics Course (03-Introb). 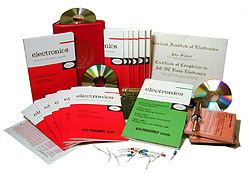 CIE Bookstore's affordable Basic Electronics Course will provide step-by-step electronics training you can do at home. Learning electronics has never been easier! This course is in stock.